In the wake of their experience with Inditex’s Massimo Dutti and Pull & Bear brands, Catalonian studio Batlle I Roig has designed the new Stradivarius headquarters in northern Barcelona. Enric Batlle and Joan Roig have built a construction on stilts that solves the parking problem. The recent completion of the new Stradivarius headquarters offers an opportunity to rediscover the career of Catalonian studio Batlle I Roig, founded almost forty years ago in Barcelona. The studio’s latest big suburban office complex is the Stradivarius headquarters in Cerdanyola del Vallès, beyond the big nature park, Parc Natural de Collserola, north of Barcelona. Enric Batlle and Joan Roig have a longstanding partnership with the Inditex Group, designing a project for the Massimo Dutti brand in Tordera, completed in 2012, followed by the Pull & Bear project in Narón in 2015. Apart from the client, what these two projects share with the typological model of the Cerdanyola del Vallès headquarters is reflection on vehicle traffic from the city to the industrial zone. These are big complexes employing large numbers of people, who travel regularly by car. 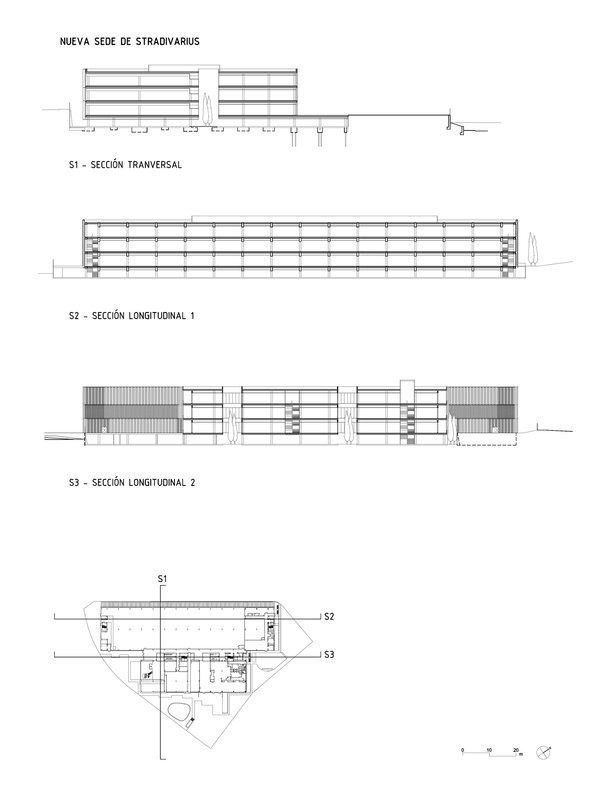 Vehicle mobility and storage of a large number of vehicles used by commuters, an increasingly important issue of great interest to the public, becomes the starting point for Batlle I Roig’s development of this privately commissioned project. This ideological inspiration arises out of the common path Enric Batlle and Joan Roig have shared since 1981, when they won their first competition, for Roques Blanques Metropolitan Cemetery in Papiol, on the border of Parc de Collserola, and decided to found their studio. In the eighties Spain was in the process of renewing its public facilities, offering a new generation of architects an opportunity to use the open competition system to access large-scale projects. Enric Batlle and Joan Roig worked on projects for big parks both within and outside the city, from Hort de la Rectoria in Alella to Parc Pegaso a Sant Andreu in Barcelona, from Parc Catalunya in Sabadell to Parc de l'Estació Vella in Igualada and more: green lungs for the city, in which pathways and perspectives are of essential importance for enriching the experience of city life. The planning process, integrating disciplines such as urban planning, construction, landscaping and infrastructure, became the key to their interpretation of the land, with the recent addition of environmental concerns. This led to the Stradivarius headquarters project, developed between 2015 and 2017, in which the approach to analysis of the requirements of an office complex attempts to enhance the suburban landscape. As in the offices of the Massimo Dutti and Pull & Bear trademarks, Batlle I Roig experiments with a new architectural genre which it calls the building on stilts. The low-cost land in this outlying area is used to build extensive complexes, which however require equally extensive parking lots. In this case, the problems of downgrading the area around the building and using a considerable amount of land are solved by making the parking area an integral part of the building. By suspending the upper floors on pillars, this building on stilts frees up much of the land at street level for outdoor parking: a solution which goes a step beyond the underground parking lot, in which the parking area becomes unhealthy and dark, providing a brightly lit, easily accessible parking area with plenty of fresh air. This solution reduces land use as compared to regular outdoor parking lots and ensures better accessibility for the building from the road, while sheltering vehicles and their owners under all weather conditions. Another feature improving the environment in the large parking area is a use of glassed-in spaces and green patios connecting the lower and upper levels. The permeability and bright light of this level is consistent with the system on the upper floors, where glass facades are sheltered by carefully designed and arranged mobile vertical sunbreaks. The layout with parallel lines serving the distribution of the offices and complementary areas, already implemented in the previous projects we have mentioned, is adapted here to suit the specific features of an irregularly shaped lot on a steep slope. The parking level, ennobled by a big gateway bearing the Stradivarius logo, is partially underground. At the entrance is a big round patio lit up via the garden level with which it is joined. White appears both on the outside of the building and inside, to diffuse light. Big open spaces and more intimate rooms provide just the right balance for the company’s needs.